attended the Shenandoah schools, and graduated from the Normal Business College there at the age of seventeen, when he began life for himself, selling goods on the road, and continued as a salesman until settling in Crofton in the spring of 1896. He had sojourned in Bloomfield in 1892 for a short time, and then returned to his Iowa home. In Crofton, Mr. Van Pelt engaged in the mercantile business in the spring of 1897, and continued in business there until 1901, when he sold out, and gave his entire time to real estate and insurance, at which he had been engaged from time to time before. He bought and shipped stock at times, when the conditions seemed favorable, and in his land deals frequently accepts a stock of goods in exchange. In this way he has owned stores in Norfolk, Bloomfield and Lynch. As a versatile man of general business, his equal is hard to find. He makes trades at which others might hesitate, and by his unusual business ability, turns to profit what others might dispose of at a loss. Mr. Van Pelt was married in Hartington, Nebraska, November 9, 1901, to Miss Clara Strand, a native of Knox county. Her parents, Charles H. and Martha (Aaberg) Strang, are natives of Norway. The mother came to America about 1873, and the father a year or two earlier. They were married in Knox county, where they have since continued to dwell. Our subject and wife have two children to bless their home, Byron and Melba. Mr. Van Pelt is a staunch democrat in politics, and in 1910 stood for the legislature as his party's candidate, his first venture into practical political life. He is a member of the Masonic order, holding membership in the blue lodge and chapter in Bloomfield. Mr. Van Pelt was on his father's farm near Shenandoah at the time of the severe blizzard of January 12, 1888. Their home was surrounded by a fine large grove, in which the high wind was not felt. Mr. Van Pelt and elder brother started to get the stock in at the time the storm broke. When they came to the corner of the grove, they realized that a storm of unusual severity was on, and the temperature was low, and the younger boy was compelled to return to the house, while the elder succeeded in getting the cattle and horses into shelter for the night. Mr. Van Pelt has traveled extensively in the west, as far east as Chicago, into the mountains of Montana, and to the southward as far as the plains of Texas. He is full of vitality, energy and acumen. He was quick in judging values, and equally as quick in estimating the measure of his man. His affable disposition makes him many staunch friends in social as well as political activities. Christian Hecht, one of the venerable pioneers of Pierce county, Nebraska, who has retired from active life, and is now living in Pierce, first came to Nebraska in August, 1884, and purchased of W. S. Mosier the relinquishment of a homestead and tree claim, a half section, six miles northeast of Plainview. He resided on the land, skillfully cultivating it until February, 1903, when he removed to Plainview to take his ease for the remainder of his life, which promises to be extended to the century mark, and which he expects to attain. Mr. Hecht is a native of the dukedom of Holstein, Germany, born in the village of Cleve, August 26, 1830. His parents, John Frederick and Ida (Sivers) Hecht, were also natives of Holstein, where the mother died. The father was a general contractor and builder, doing carpentry as well as mason work, and also was a machinist, and intended his son, Chris, for the same career. After working for a time with the father, the boy decided that he preferred an occupation that would not take him so much from home, and induced his father to apprentice him to a cabinet maker, where he finished his apprenticeship just prior to emigrating to America. He served four years for only his board, his father having to clothe him, and prior to completing his apprenticeship, he was called out in the reserves in 1850, during the war between Germany and Denmark. He learned in later years that a friend, Mr. James Nelson, had fought in the battle of Idstedt, on the opposite side. After serving out the remaining two months of his apprenticeship, Mr. Hecht had an opportunity to come to the new world in company with his future father-in-law and his family. Embarking, April 1, at Hamburg, Germany, in an old two-mast sailing vessel, the "Alter Peter," so small that but a hundred passengers could be accommodated, they landed, after a voyage of six weeks, at the port of New York, and journeyed direct to Joliet, Illinois, where Mr. Hecht secured work at his trade, within a year repaying his passage money, which was advanced by Mr. Deerson. He then married a daughter of Mr. Deerson, and established a family of his own. For ten years he worked at his trade in Joliet before moving to Momence, the same state, where he worked for three years. braska property, in due time proving up on the homestead quarter-section, and also on his timber claim. Mr. Hecht was married in Joliet, Illinois, May 23, 1853, to Miss Margaret Deerson, daughter of Peter N. and Helma (Miller) Deerson, all natives of Holstein, Germany. Mrs. Hecht passed away in Nebraska, January 13, 1894. Of eight children born to her, three died in infancy. Those attaining majority are: John F., who married Jessie F. Stocking, both of whom have passed, away leaving four children; Serena, married, and living in Canada; George, a sketch of whom appears elsewhere; Alice, deceased, who married Albert Herbert, of Grant Park; Herman J., county treasurer, whose career is related on another page; and Charles C., who is a traveling salesman, with headquarters at Lincoln, Nebraska. John Frederick Hecht followed his son, Chris, to America in 1854, bringing his remaining son and two daughters, all of whom lived creditable lives in Will county, Illinois, where all passed away, leaving Chris, the eldest and the last of his generation, well and hearty, with prospect of rounding out a hundred years. He was reared in the Lutheran church, but of late-years has been an attendant and supporter of the Congregational church. For fifty years he has been a member of the Masonic fraternity, having been made a Mason in Joliet, Illinois. From his advent to the American republic, he has adhered to the principles of the republican party, and would have cast his first vote for their first candidate, Fremont, had he been long enough on American shores. His first vote, however, was for the great emancipator, the first successful candidate of that dominant party. No one holds a higher place in the hearts of the citizens of Pierce county, old and young, than our subject. He richly deserves the comforts he now enjoys, and is a sterling example to the young, an inspiration to emulate his thrift, energy and honesty, if they would will substantial success in life, and leave a revered memory on passing to the great beyond. N. P. Carlson, one of the first settlers of the region where he chose his home in the early days, occupies a good home and valuable property in section twenty-one, township thirty, range two, where he is surrounded by a host of warm friends and acquaintances. Mr. Carlson has done his full share in the upbuilding of his home county and state, and is a highly esteemed and respected citizen of this section. Mr. Carlson is a native of Sweden, having first seen the light in the year 1854, and is a son of Carl and Helen Nelson. He received his education in his native land, and also helped his father on the farm. When he, reached the age of twenty-five years, Mr., Carlson decided to come to the new world, of which he had heard so much, and of the cheap land to be obtained for almost the asking. In 1879, he left Sweden to come to America, embarking on the steamship "State of Nebraska," and landed in New York City. After reaching the United States, he went direct to Iowa, where he lived five years. Mr. Carlson's advent to the state of Nebraska dates from 1886, when he came to Antelope county, living there seven years on a timber claim, which he had taken up shortly after coming from Sweden. In 1893 he, with his family, came to Knox county, Nebraska, where he bought one hundred and sixty acres of fine land, which he has steadily improved, until now he has a fine home and good improved farm. Mr. Carlson was united in marriage in 1884 to Miss Mathilda Sophia Anderson, a native of Sweden, and Mr. and Mrs. Carlson are the parents of a family of five fine children, whose names are as follows:, Nels Clarence, Inez Sophia, Leonard (now decased [sic]), Carl Algot, Arvid Rudolph. Mr. and Mrs. Carlson and family enjoy the respect and high esteem of all who know them, and Mr. Carlson, as before stated, is held in high regard in the community in which he dwells, and is known as one of the substantial citizens of his region. He now owns two hundred and eighty acres of land in Knox county, and eighty acres in Lincoln county, Nebraska. He is a republican, and he and his family belong to the Swedish Lutheran church at Wausa. The hardy Norseman has always been a desirable citizen in the settlement of the new world, and the settlement of Swedes in and around Wausa, Nebraska, is but another example of their sterling worth. Of this progressive race is John E. Baggstrom, manager of the Union Telephone Company of Wausa. The father, Eric Baggstrom, was a native of the village of Ofvanoker, Helsingland province, Sweden, born in 1844. He was a farmer in Scandinavia, and followed that vocation on taking up his residence in the new world. Emigrating about 1867, he crossed the North sea from Guttenburg to Hull, then traversed England by rail to Liverpool, and there embarked in the steamer "City of Baltimore" for New York, and, after a voyage of eleven days, landed in the western metropolis. time found the manufacture of them quite profitable. His first finished product was traded for a cabinet organ and five hogs. The proceeds of this craft he invested in land near Stratford, and moved to this locality, where he lived until he sold his eighty acres, and moved to Nebraska in 1885. He purchased one hundred and sixty acres of land from a homesteader, five miles northwest of where Wausa now stands, and lived here until 1907, when he sold, and retired from active life. He spent two years, from 1889 to 1891, contracting and building in San Francisco. When he came to Nebraska, the townsite of Wausa was all open prairie, and in making hay one season, he put up a stack where the Methodist Episcopal church now stands. His industry is unabated, and, although retired from farming, he takes occasional jobs at carpentry and joinery to keep his hands from being idle. Eric Baggstrom was married in Sweden to Miss Ellen Olson, a, native of the same village and province where he was born. Of their family of five children, two survive, the son and a daughter, Emma, who has remained dutifully beneath the parental roof. J. E. Baggstrom was born within a mile of Stratford, Iowa, January 10, 1870. He attended school in Iowa, and one year after coming to Nebraska. He attended the Lutheran College at Wauhoo, completing the course in fourteen months - three months the first year, four the second, and seven the third - teaching school between times in order to pay his way. Few, if any, ever completed the course in so few months, but it required burning much of the midnight oil. He made an especial study of grammar, which was not a favorite study with him, and became so proficient that he devised a primary grammar for use in his own schools, making the study clear and interesting to young minds. He also devised a chart of universal history, for which the college professors offered him a price for use in their institution. Mr. Baggstrom intends to complete these useful works in time, and place them in the schools of the country. He is the author, too, of a table for instantly computing the price of various pieces of lumber, saving, by this tabulation, hourse [sic] of time in computing the amount of a large bill of timber. In September, 1898, in company with Mr. F. E. Anderson, Mr. Baggstrom established the "Wausa Gazette," with the prediction of its of its [sic] predecessor that it would be short-lived. But the earliest journal has long since been discontinued, while the "Gazette" is one of the most flourishing country papers in this section of Nebraska. Mr. Baggstrom sold his interest in the paper, January 1, 1901, and re-entered the teaching profession, taking the school at Winnetoon, where they had difficulty in securing a competent teacher, and for one year he taught the grammar department of the Wausa school. Mr. Baggstrom had learned building from his father when living in San Francisco, and, after disposing of the "Gazette," engaged in building for five years. In the winter of 1906, he became manager for Lundberg Brothers, of their Wausa yards, and had charge of the same until the spring of 1911, when he took charge of the Union Telephone Company, whose home office is at Wausa. He has acquired a good knowledge of architecture, and has planned many of the public and private buildings of Wausa and vicinity. Mr. Baggstrom was married in Wausa, May 6, 1903, to Miss Nilla Anderson, a native of Sweden. Her parents, Andrew and Nilla Anderson never emigrated to America. The father died in the old country, and the mother, with one daughter, are all of a family of fourteen that are left there, and they may follow to the new world soon. Those here came one at a time, each helping those left behind to emigrate. Four children have been born to Mr. and Mrs. Baggstrom, named Carl O. T., Lillie A., Mildred G. and Vivian L.
Mr. Baggstrom is a republican in politics, and a member of the Lutheran church. He is now township treasurer, and was township clerk for many years. When the township, in which his father settled, was divided, Mr. Baggstrom had the honor to select the name for the new division, and named it Columbia. Wausa was named for Wasa, one of the Swedish kings, and at Mr. Baggstrom's suggestion, the spelling was changed to conform to the English pronounciation. fornia, he gave the coat to the neighbor as a reminder of the occasion when a friend was sorely in need. Although he had but a small herd of cattle, he lost all of them in this storm. The family knew hard times in the early days. For two years in Iowa, they had no bread but that made from corn meal. They lived several years in a dugout after coming west, before being able to build a better house. At this writing, May, 1911, Mr. Eric Baggstrom. is planning to soon go on a trip to his native country. In the gentleman above named, we have another one of the sturdy sons of Norway who left his native land and came to this country to help in the steady march of progress, and incidentally to build up for himself a home and fortune. Mr. Olson resides on his pleasant farm on section thirty-two, township twenty-two, range three, where he has succeeded in building up one of the valuable estates of the locality, and is considered one of the substantial agriculturists of the community. Mr. Olson is a native of Norway, in which country he was born October 12, 1844, a son of Omon and Julia (Catal) Olson, who were natives of Christiana, Norway, the father dying when our subject was but six years of age. In 1853, Mr. Olson, our subject, with his mother. left their native land for America, sailing from Christiana on the sailboat "Inga," being eight weeks on the sea. They landed in Quebec, Canada, and from there came on to LaSalle, Illinois, settling there, where they remained twenty-two years; during his residence here Mr. Olson was married, of which we will write further on in this sketch. In 1882 Mr. Olson came to Madison county, Nebraska, where he bought out a tree claim and homestead right, first building a frame house on this land. Mr. Olson has had his share of discouragement and losses since his residence here, and as late as 1894 suffered the loss of his entire season's crops by the hot winds that were a result of the terrible drouth of that year, and which burned out the crops for miles in extent; but he has persevered, and now owns four hundred and eighty acres of choice land, on which he has twenty acres of fine trees. Mr. Olson was united in marriage to Miss Anna Craw, October 14, 1871, Miss Craw being a native of Norway, and a daughter of Helge and Anna Craw, who were also natives of Norway. Mr. and Mrs. Olson are the parents of the following named children: Emma, deceased; Anna, John, deceased when small; John, Andrew Alloy, Ulysses, Hilmer, and Clara. They are a well known family, and enjoy the respect and esteem of all who know them, and in their pleasant home are surrounded by a host of friends and acquaintances. Robert Given, an honored and respected pioneer of Custer county, Nebraska, had the sincere respect and esteem of a large circle of friends, by whom his death was deeply deplored. He had been recognized as a public-spirited and substantial citizen and represented the best intrests [sic] of his county and state during his long life there. He and his wife whose maiden name was Mahulda (Jordan) Given, came from West Virginia to Whiteside county, Illinois, in 1867. In 1878 they came to Fillmore county, Nebraska, with an emegrant [sic] car containing horses, cows, and household goods, and bought land there from the railroad company. In the fall of 1884, Mr. Given, with his wife, their sons, Ellis, and Ewell, and their daughter, Debora, came into Custer county, and took up a homestead comprising southwest quarter of section twenty-eight, township eighteen, range twenty-one. Their son, Sampson, had preceeded them a year, filing on a homestead and timber claim near where Merna is now situated. They were among the early settlers of the region and among the best known families in Custer county. Mrs. Given died January 19, 1809 [sic], and her husband died April 3 of the same year, at the home of his son, Ellis. Mr. and Mrs. Given were survived by the following named children, five of whom reside in Nebraska: Kate, now Mrs. J. S. Kennard, of Fillmore county; William, of Lincoln; Sampson and Ellis Given, and Debora, now Mrs. James Anderson, of Custer county. Ewell lives in Wyoming. Sketches of Sampson and Ellis appear elsewbere in this work. Harvey Maricle, a former venerable resident of Boone county, Nebraska, was born in Greenbriar county, West Virginia, on, January 5, 1827, and died September 14, 1910, on the home place. He was the sixth in a family of eleven children born to Jacob and Sarah Maricle, who were of German descent but natives of America, the former born in Pennsylvania and the mother in West Virginia. When our subject was about eight years of age, the family left West Virginia and settled in Smith county, Tennessee, remaining for two years, then moved to White county, Illinois, where Harvey Maricle grew to manhood. At the age of twenty-two, he strated [sic] in life for himself, locating at Grayville, in the northeast corner of White county, and followed his trade of wood-work and wagon-making, later taking up the work of a carpenter and builder. He made that his home up to the spring of 1860, at that time going to Wabash county, that state, and settled on a farm. Knowles, who was born and raised in that county. Four children were born to them, a daughter dying in infancy, and three sons, Leonard Fletcher, Rozander C. and Carson Wallace, still living, are well known residents of Boone county; the two former married, and the last mentioned living with his mother. Portraits of Mr. and Mrs. Maricle appear on another page. Mr. Maricle came to Boone county, Nebraska in May 1871. He filed on a homestead on section eighteen, township nineteen, range five, also took a pre-emption of one hundred and sixty acres in on section seven, and proved up on both. His first dwelling was built from lumber hauled from Columbus, nearly all the work being done by himself, and as soon as it was completed, he returned to Illinois and brought his wife and children back with him, they arriving in July. The first preaching service in the county was held in this new home. There they went through pioneer experiences, being among the very first settlers in that portion of the county, and the original homestead was Mr. Maricle's home until his death, and is now occupied by his widow and son. He improved the farm in fine shape, having good buildings of all kinds, and conveniences in the way of machinery, etc. There is a nice grove, and plenty of fruit and other trees, good fences, and everything to make it one of the valuable estates in that region. Mr. Maricle was one of the original appointees to organize the county of Boone, this being in 1871, and at that time was county commissioner, the meeting at which the organization was perfected, being held at Mr. Maricle's home. He also served as postmaster at Boone, holding the position for about twenty years, the postoffice being located at his home for seven years, then moved to Boone, when the Union Pacific railroad was built, it being the third postal station established in the county. At the age of thirty-two, Mr. Maricle was converted and joined the Presbyterian church, and lived a christian life ever after. 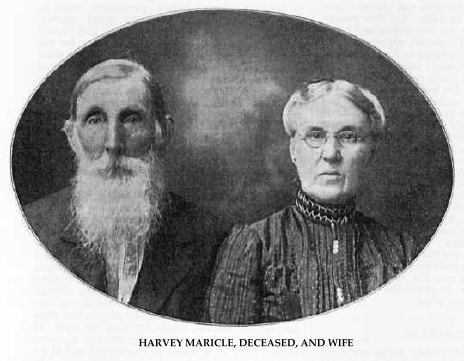 Harvey Maricle, Deceased, and Wife. Few men living in Nebraska today can recall the primitive conditions of so early a day as Mr. Harry Fullen, formerly of Osmond, but now a resident of Grand Island. His birth occurred on April 11, 1861, in Burt county, Nebraska, and at that time the narrow rim of settlements extended but a few miles west from the Missouri river. As a boy he has seen a thousand Indians in a body moving to or from the reservations north of Omaha. In these migrations the ponies were packed with the tent covering, with the lodge poles fastened above and trailing out behind, and frequently a platform was lashed to these beyond the reach of the pony's tail, and on this was places babies, and occasionally a dog or some other goods, the balance of the band walking except the chief, or lord and master of the tribe, for whom the best ponies were reserved. Mr. Fullen also well remembers stories of their lives, and at one time there must have been a fierce battle in the vicinity, for in an ash grove near his boyhood home were found skulls and bones in large numbers. In this spot some of the reckless young men of the locality were wont to assemble and shoot at the skulls for the drinks to be had at Chris Weiser's, a German who kept a store and groggery at the landing where goods for Tekamah were put ashore. At this early date oxen were the only draught animals in the vicinity, and our subject's success in driving them was not an astonishing thing, going their own sweet way without heed to his wishes. The market for the produce of their farm was some distance away, and at times when the river was frozen over their drsesed [sic] hogs were hauled as far as Red Oak, Iowa, before purchasers could be found, although Omaha was their usual market, which was fifty miles away. The trip took several days to accomplish, and it was necessary for the farmers to go in parties of several people, as there was a band of desperadoes which infested the trail along the Missouri river and would hold up the returning settler and rob him of his money and goods. Therefore, when one was ready to go to market, all the neighbors were called on and a "killing bee" was held, slaughtering from forty to fifty hogse [sic], and a hundred or more turkeys and as many chickens, the occasion being made a frolic. Mr. Fullen's early years were spent in a log house, as well as his first schooling, slabs at that time being used for seats, but later on after he had prospered on his farm near Tekamah, he ordered from St. Louis a ready framed building requiring only to be put together and raised. Mr. Fullen's father, James Fullen, was born about 1833, in County Tyrone, Ireland. His maternal uncles were all sea captains who had visited every part of the world on their various voyages, and when four years of age, his father, Barney Fullen, with his family, emigrated to the United States, embarking at Belfast in an old sailing vessel. They were buffeted by the storms and high seas for six months before sighting the coast of America, and on landing, went directly to Essex county, New York, where he was reared, and at an early age apprenticed to the carpenter's trade. In 1856 be settled in Henry county, Iowa, where he married and resided until coming to Nebraska, as stated above. Mr. Fallen, father of our subect [sic] was married in Mt. Pleasant, 1859, to Rebecca J. Haywood, a native of Youngstown, Ohio, she is now deceased, her death occurred in August, 1910, and is buried in the family lot at Tekamah, Nebraska, a beautiful plat beside that of the father overlooking the Missouri valley viewing many scenes of their pioneer days. Of her seven children, Harry, the subject of this sketch, is the eldest. He was married September 19, 1900, to Louise M. Junge, a daughter of M. F. and Catherine Junge, a sketch of whom appears in this work. byterian church, and have hosts of friends in their comunity [sic]. He is a member of the Modern Woodmen of America, and Masonic order. Politically he is a democrat. Mr. Fullen has travelled much through the west, having made three trips to Old Mexico. He is very observing, has a good memory, and the gift of relating his experiences in an interesting manner, thus being a most entertaining and congenial companion. He is extensively interested in real estate and banking in the northern part of Pierce county, and is counted among the successful and prominent business men of the state. One of the early settlers of Pierce county, who has filled an important place in the community, was Michael F. Junge, who died on August 29, 1896. He was a man of much broader education and wider experience than the usual emigrant seeking opportunities in the great republic, and he was considered one of tbe foremost citizens of his locality during his residence in Nebraska. Mr. Junge was born in the village of Elmshorn, Province of Holstein, Germany, on January 22, 1833. His father, Diedrich Ferdinand Junge, died when our subect [sic] was a small boy. His mother, Helecia (Bartels) Junge, was a woman of strong character and gave her children each a good education to fit themselves for the battle of life. As a boy, Mr. Junge had a longing for the sea, and to cure him of this the mother sent him on a voyage to Greenland. This, instead of curing him, was exactly to his liking, and he made two more voyages to the same ports, so his mother became reconciled and sent him to the schools of navigation at Flensburg and Hamburg, from both of which he graduated, later taking an academic course at other colleges, becoming proficient in Greek, Latin, Spanish, French and English. He held a Master's certificate, but usually served as first mate. During eighteen years spent on the high seas he visited Africa, the Orient, doubled Cape Horn three times and in 1851 called at San Francisco and witnessed the wild rush of those seeking gold during the excitement in that country. Returning from a voyage to South America, in the Santa Maria on one trip, the vessel sank in the roadstead of Bremen Haven, but managed to keep afloat until shallow water was reached and all were saved. It was known that this ship was unseaworthy, and the captain feared that she might go down before sighting land. He being sick in his berth at the time, Mr. Junge carried him on deck and succeeded in getting him in one of the Ship's boats when the Santa Maria sank in the water. Her cargo of coffee salvaged from the wreck, was on sale for a umber [sic] of years in that region. On coming to America Mr. Junge sailed the great lakes for four years, and for two years was in the service of the Federal government on the Mississippi river, his technical knowledge making him a valuable man in the service. In 1868 he returned to his native land and for four years was in the commission business in Altona with his brother. He then came back to America, settling at Belle Plaine, Iowa, where he engaged in the agricultural business, remaining there for thirteen years. During this time he had purchased a tract of land near Osmond, and in 1886 came to Pierce county for permanent residence, occupying his original homestead until his death. Mr. Junge was married at Belle Plaine, Iowa, in January, 1873, to Katherine Charlotte Nagel, a native of the village of Buchholz, Holstein, Germany, coming to America with her parents in 1852 in a sailing vessel. They were landed at New Orleans after a voyage of six weeks, and from thence went to St. Louis where the family spent one winter; when navigation opened in the spring, coming by boat to Davenport, Iowa, where the father has made his home ever since. Mrs. Junge is at present living at Big Springs, Nebraska. The Junge family has been prominently known in the northern provinces of Germany for generations, W. Junge, an ancestor, having built the first Lutheran church in that region after the Reformation. They have always been a family high in culture and education, foremost in business and social circles in their native country. Francis Crowe, an old prominent resident of St. Paul, enjoys a pleasant home in that beautiful city. He has spent many years in Howard county, during which time he has succeeded in accumulating a valuable estate consisting of five hundred acres of choice farm lands besides other interests here, and is known as one of the wealthy men of that region. Our subject is a native of Canada, born October 20, 1837, and was the eldest child in a family of eight. He grew up in that country, during his young manhood following farming and stock raising, and was married there January 31, 1858, to Alice Crowe, five children resulting from their union., three of whom died in infancy, and the mother died in Canada in 1868. In the following year he married Bessie Crowe, and ten children were born of this marriage, seven now living, namely: Alice, Belle, Charlie, Viola, wife of E. W. Docker, they living in Black Buke, Wyoming; Ida, wife of Allen McPherry, Wallace M. and Bruce, the three last mentioned living at home, while the others are married all residing in Howard county. ceeded in improving the place in good shape, erecting substantial buildings and cultivating more land each year until Mr. Crowe now has one of the valuable estates in the locality, consisting of about five hundred acres, all choice farm land which he has stocked up in fine shape, and while he still takes an active part in the management of his farming interests, he makes St. Paul his residence, surrounded by many friends, the family being among the prominent citizens of their community. Two children of Mr. Crowe's first marriage are living, William Henry Crowe, now in South McAllister, Oklahoma, and George Crowe, a well known resident of South Omaha, Nebraska. Harrison E. Davis, the only son of George W. and Zilplia Williams Davis, was born in Lewis county, New York, on May 15, 1855. Both father and mother were of New England stock, the mother being a descendant of Roger Williams. In the fall of 1865, the Davis family went to Minnesota where the son, Harrison E., the subject of this sketch, grew to manhood on the farm, later engaging in farming for himself. On December 31, 1874, Mr. Davis married Eliza Boyd, who was born in Pennsylvania. In 1878, Mr, Davis, with his wife and one daughter, came to Valley county, Nebraska, purchasing one hundred and twenty acres from the Burlington and Missouri railroad, section twenty-three, township eighteen, range thirteen, just north of North Loup. The following year Mr. Davis took a homestead of one hundred and sixty acres near Ord, but later sold his right and returned to his first farm, which remained the "old home place" for many years. Mr. Davis was always interested in the progress of the county along educational lines and was instrumental in organizing two school districts and for ten years served as treasurer of district number forty-two. In the fall of 1903, Mr. Davis left the farm, moving to North Loup in order to engage in the furniture and undertaking business. He is prosperous and successful, owning good city properties and splendid interests. Eight children were born to Mr. and Mrs. Davis: Fanny S., H. Eugene, who lived at Leoo, China, for three years where he was a missionary, returning to the states in 1910 to recover health lost in that malarious country; George E., David A., Orson E., J. Stennett and Ross O. One child, Orville, died in infancy. Mr. Davis and his family are widely and favorably known and for many years have been active members of the Seventh Day Baptist church. A. F. Reeves, for the past twenty-one years a prominent representative of the farming community of Madison county, Nebraska, has a pleasant home in section eighteen, township twenty-two, range two, west. He is one of the worthy citizens of that region, and his success and good name are well merited. Mr. Reeves is a native of North Carolina, his birth occurring September 13, 1852, and is a son of Jesse and Nancy Reeves, both of Virginia birth. Our subject's father enlisted in 1861, in Company I,, Twenty-sixth North Carolina Artillery in the Confederate army, and was killed in battle with guerillas the last year of the war. Mr. Reeves' grandfather came to America from England, thus making our subject a descendant of that country. Mr. Reeves came to Madison county, Nebraska, in 1882, and bought the McCutchen farm, which was not then very highly improved; he has steadily improved this land until now he owns one hundred and sixty acres of finely improved land and engages in mixed farming, at which he has made a success. Mr. Reeves was united in marriage April 12, 1887, to Miss Maggie Warden, and Mr. and Mrs. Reeves are the parents of six children, whose names are as follows: Joe, David, Betty, Will, John and Jessie. Mr. and Mrs. Reeves and family have the respect and esteem of all who know them, and in. their pleasant home are surrounded by a host of good friends and acquaintances. Daniel Barrett, of Broken Bow, is an early settler of Custer county and has always been closely identified with the progress and upbuilding of his part of the state. He is an energetic and successful man of affairs and owns a fine stock and grain farm of nearly five hundred acres, which he has improved, developed and equipped by his own efforts. He also owns some desirable city property and in 1904 purchased the pleasant home in Broken Bow where the family have since resided. Mr. Barrett was born in Warren, Illinois, March 17, 1854, a son of Hercules and Susan (Hawkeye) Barrett, natives of England. The parents came to America in 1848, locating in Wisconsin, but later removed to Cass county, Iowa, where both died, he in 1887 and she in 1885. Their children who now survive are: Henry lives seven miles west of Merna in Custer county; a daughter lives in Jackson county, Iowa, one in Omaha, and one in Cass county, Iowa; one daughter lives in Spokane, Washington.